Author(s): Dharmendra Kumar Yadav, Sangeeta Dhawan, Akanksha Chauhan, Tabish Qidwai, Pooja Sharma, Rajendra Singh Bhakuni, Om Prakash Dhawan, Feroz Khan. Metabolic & Structural Biology Department, CSIR-Central Institute of Medicinal and Aromatic Plants, P.O.-CIMAP, Kukrail Picnic Spot Road, Lucknow-226015 (U.P.) India. 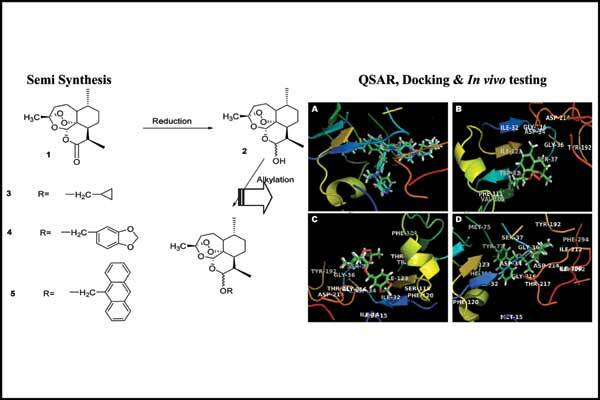 To screen the active antimalarial novel artemisinin derivatives, a QSAR modeling approach was used. QSAR model showed high correlation (r2= 0.83 and rCV2= 0.81) and indicated that Connectivity Index (order 1, standard), Connectivity Index (order 2, standard), Dipole Moment (debye), Dipole Vector X (debye) and LUMO Energy (eV) well correlate with activity. High binding likeness on antimalarial target plasmepsin was detected through molecular docking. Active artemisinin derivatives showed significant activity and indicated compliance with standard parameters of oral bioavailability and ADMET. The active artemisinin derivatives namely, β-Artecyclopropylmether HMCP (A3), β– Artepipernoylether (PIP-1) (A4) and 9-(β-Dihydroartemisinoxy)methyl anthracene (A5) were semi-synthesized and characterized based on its 1H and 13C NMR spectroscopic data and later activity tested in vivo on mice infected with multidrug resistant strain of P. yoelii nigeriensis. Predicted results were successfully validated by in vivo experiments. Keywords: Artemisinin, ADMET, docking, malaria, plasmepsins, p. yoelii nigeriensis, QSAR. Affiliation:Metabolic & Structural Biology Department, CSIR-Central Institute of Medicinal and Aromatic Plants, P.O.-CIMAP, Kukrail Picnic Spot Road, Lucknow-226015 (U.P.) India. Keywords:Artemisinin, ADMET, docking, malaria, plasmepsins, p. yoelii nigeriensis, QSAR. Abstract:To screen the active antimalarial novel artemisinin derivatives, a QSAR modeling approach was used. QSAR model showed high correlation (r2= 0.83 and rCV2= 0.81) and indicated that Connectivity Index (order 1, standard), Connectivity Index (order 2, standard), Dipole Moment (debye), Dipole Vector X (debye) and LUMO Energy (eV) well correlate with activity. High binding likeness on antimalarial target plasmepsin was detected through molecular docking. Active artemisinin derivatives showed significant activity and indicated compliance with standard parameters of oral bioavailability and ADMET. The active artemisinin derivatives namely, β-Artecyclopropylmether HMCP (A3), β– Artepipernoylether (PIP-1) (A4) and 9-(β-Dihydroartemisinoxy)methyl anthracene (A5) were semi-synthesized and characterized based on its 1H and 13C NMR spectroscopic data and later activity tested in vivo on mice infected with multidrug resistant strain of P. yoelii nigeriensis. Predicted results were successfully validated by in vivo experiments.